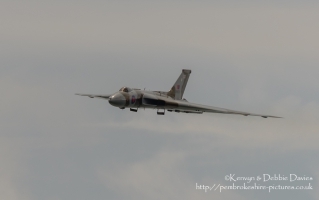 The Spirit Of Great Britain is the only airworthy example of the 134 Avro Vulcan V bombers that were operated by the Royal Air Force from 1953 until 1984. Vulcan XH558 served with the RAF between 1960 and 1985 in the bomber, maritime reconnaissance and air-to-air refuelling roles. The RAF operated XH558 as a display aircraft from 1986 until 1992, when budget cuts forced its retirement. 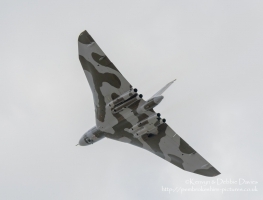 It is presently operated by the Vulcan to the Sky Trust as a display aircraft, funded entirely by charitable donations and the UK Lottery's Heritage Fund. 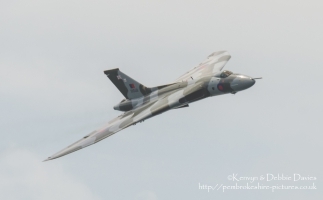 It is registered with the United Kingdom Civil Aviation Authority as G-VLCN but has an exemption to fly in Royal Air Force markings as XH558. 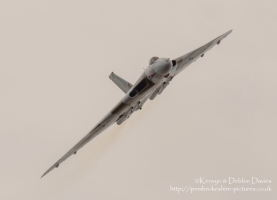 October 2015 will see the last flight of the Vulcan as it becomes impossible to keep it airworthy. Description The Spirit Of Great Britain is the only airworthy example of the 134 Avro Vulcan V bombers that were operated by the Royal Air Force from 1953 until 1984. 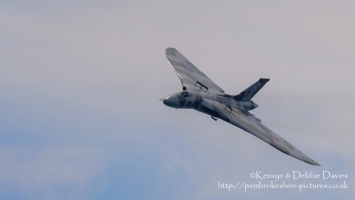 Vulcan XH558 served with the RAF between 1960 and 1985 in the bomber, maritime reconnaissance and air-to-air refuelling roles. The RAF operated XH558 as a display aircraft from 1986 until 1992, when budget cuts forced its retirement.